the third Australian Google.org Impact Challenge, with $5.5 million available for nonprofits and social enterprises to support projects that use technology to tackle our biggest social challenges. The 2018 Google.org Impact Challenge aims to help Australian nonprofits and social enterprises that are finding new ways to address some of our most challenging problems - from education and economic opportunity to social inclusion. Anil Sabharwal - Vice President of Product, Google. These judges will review applications and hear live pitches from ten finalists at an event in November to determine the winners. All Australians will be invited to vote for their favourite idea. Nonprofits and social enterprises have until 6 July 2018 to apply. Get involved today and help support Australia’s forward thinkers! Last month, we launched the third Australian Google.org Impact Challenge, with $5.5 million available for nonprofits and social enterprises to support projects that use technology to tackle our biggest social challenges. 1. The redesigned Explore tab gives you quick recommendations for restaurants, bars, and cafes in any area you’re interested in. Whether you’re staying local or planning a trip, you can always find the perfect spot no matter where you are in the world. 2. Find the best burger in town or track the top brunch spots in the city with trending lists from local experts and Google’s algorithms. 4. Know what’s going on. On Android, the new Explore tab now surfaces the top events and activities happening in your area. You can see photos, descriptions, and filter by categories like “good for kids”, “cheap” or “indoor or outdoor” so you can find just the right activity to fit your mood. The new Explore tab is now available to all Android and iOS users globally. 5. Make plans faster. If you have Location History turned on, each restaurant or bar now features “Your match”, a numeric rating that tells you how likely you are to enjoy a place based on your own preferences—so you can save time scrolling through lists of reviews and quickly make a decision about where to go. 6. Tell Google Maps about your food and drink preferences so it can surface better dining recommendations as you eat your way around town (to do this, go to your Settings to select the types of cuisines and restaurants you like, along with what you’re not so into). Your match is now available to Android users worldwide. 7. Get inspired for your next culinary adventure. The new “For you” tab will keep you in the know about everything happening in areas you care about whether it’s near your home, work, or a city you visit frequently. Following a neighbourhood allows you to instantly see if there’s a hot new restaurant in the area, a new cafe that’s a perfect match for your tastes, or if one of your favorite dining spots is in the news. The For you tab is now available on Åndroid in Australia, the U.S., U.K., Canada, and Japan, with content ramping up this week. To start exploring, update your Google Maps app from the App Store or Play Store today. Share your favourite list of restaurants with us on Twitter or Instagram with the hashtag #OnGoogleMaps, and make sure to follow @GoogleMaps for more tips on how you can use Google Maps to get around and discover your neighbourhood. YouTube lets creators connect with their community and gives them the opportunity to earn money while doing what they love. Thanks to advertisers, creators around the world have been able to build businesses, creating an entirely new global economy that’s seen incredible growth. The number of creators earning five figures a year is up by 35 percent and the number of creators earning six figures is up by 40 percent. As in previous years, the vast majority of the revenue is coming from our advertising partners. We’ll continue investing here, but we also want to think beyond ads. Creators should have as many ways and opportunities to make money as possible. With Channel Memberships, viewers pay a monthly recurring fee of US$4.99 to get unique badges, new emoji, Members-only posts in the Community tab, and access to unique custom perks offered by creators, such as exclusive livestreams, extra videos, or shout-outs. Channel Memberships have already been available for a select group of creators on YouTube as Sponsorships. We’ve seen a lot of creators find success with this new business model. So, we’ll soon be expanding this to eligible channels with more than 100,000 subscribers on YouTube under the new name Channel Memberships. We hope to bring it to even more creators in the coming months. Neal Mohan, Chief Product Officer, recently watched "Lucas the Spider - Plush Introduction." built on top of all the music on YouTube that you can’t find anywhere else - personalised and all simply organised in one new app and web player. Recommendations built for you. A home screen that dynamically adapts to provide recommendations based on the artists and songs you’ve played before, where you are and what you’re doing. Chilling at the beach with friends? Need some motivation? The right music is right here, built just for you. Thousands of playlists across any genre, mood or activity. Try The Happiest Pop for brighter tunes on a cloudy day, the Pop Hotlist for the biggest hits around the world or Independent Women of Australia for the best tunes from the finest female-centric alternative artists Down Under. Smart search so we’ll find the song, even if you can’t remember what it’s called. “That space-themed Spice Girls song in the desert.” Here you go. You can also search by lyrics (even if they’re wrong). It’s “Hold me closer, Tony Danza”, right? The hottest videos. We’ll keep you on top of what’s hot! The hottest videos in the world right now are right there, on their own dedicated Hotlist screen. Today in Australia, it features “I’m Upset” by Drake, while in the U.S., it’s “Nervous” by Shawn Mendes, in the U.K., it’s “Drippy” by IAMDDB, and in France, it’s “When we ride” by Møme. Ad-free listening, downloads and more. Get YouTube Music Premium to listen ad-free, in the background and on-the-go with downloads. Plus, your Offline Mixtape automatically downloads songs you love just in case you forgot to. For a limited time, get three months free of YouTube Music Premium, ($11.99 per month after, $17.99 per month for a Family Plan)*. Starting today, YouTube Premium (formerly YouTube Red) will be available in 17 countries, providing members with the benefits of Music Premium, plus ad-free, background, and downloads across all of YouTube. YouTube Premium members also get access to the full slate of YouTube Originals shows and movies including the hit series Cobra Kai, Impulse, F2 Finding Football and The Sidemen Show. For a limited time, get three months free of YouTube Premium here, ($14.99 per month after, $22.99 per month for a Family Plan)*. Current YouTube Red and Google Play Music members (including family plans) in Australia, New Zealand, the U.S., and Mexico will automatically receive access to YouTube Premium at their current price. Google Play Music subscribers in all other countries will automatically receive access to YouTube Music Premium at their current price as it becomes available there. Nothing is changing with Google Play Music - you'll still be able to access all of your purchased music, uploads and playlists in Google Play Music just like always. 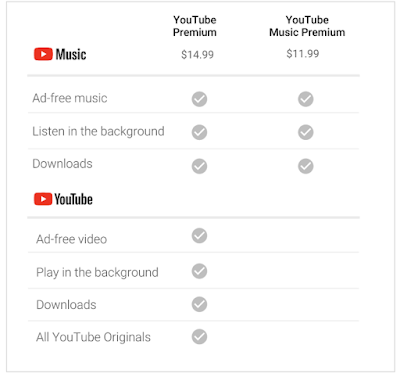 *YouTube Music Premium is $11.99 per month and YouTube Premium is $14.99 per month for individual memberships in Australia. Pricing and Family Plan availability varies by country. 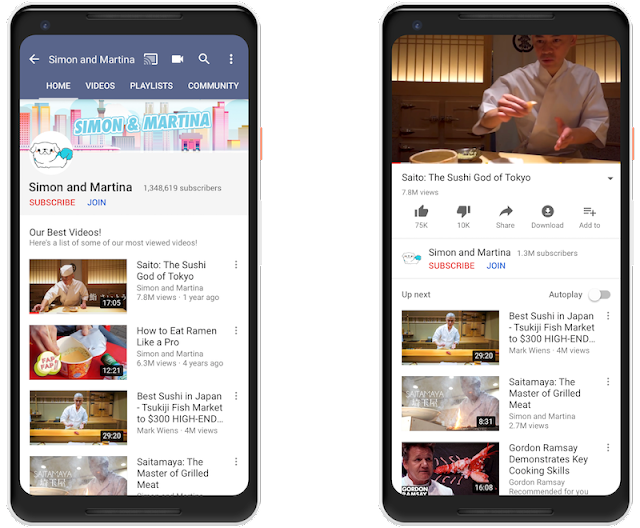 Only first-time YouTube Premium, YouTube Music Premium, YouTube Red and Google Play subscribers are eligible for free trials. South Korea will only offer YouTube Premium at the current price of YouTube Red. The wait is over! Starting today, YouTube Music is available to everyone in Australia, New Zealand, the U.S, Mexico and South Korea* in addition to 12 new countries including Austria, Canada, Finland, France, Germany, Ireland, Italy, Norway, Russia, Spain, Sweden, and the United Kingdom. Now fans around the world can find more of the music they love and effortlessly discover new favourites. YouTube Music is a new music streaming service built on top of all the music on YouTube that you can’t find anywhere else - personalised and all simply organised in one new app and web player.